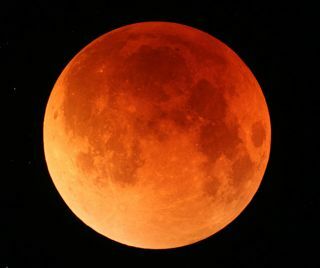 Those who gazed into the darkened skies early Tuesday morningcaught a breathtaking view of a blood-red lunar eclipse. The second such event of the year gave those along the PacificRim, including California, New Zealand and eastern Australia a view of a totallunar eclipse from start to finish. Inhabitants in the Central U.S. and Canada through New England and even Japan, however, also got a spectacular view. Earth's full shadow, or umbra, crept over the moon at 4:51 a.m.EDT (1:51 a.m. PDT) and completely covered it by 5:32 EDT (2:52 PDT). The celestialevent ended after sunrise on the East coast and at 4:22 a.m. PDT on the Westcoast. SPACE.com's SkywatchingColumnist Joe Rao contributed to this report.